A bow tie is a great alternative to a tie, a nice accessory for the evening dress and just a fashionable piece of clothing able to make you look elegant. There are numerous types of bow ties varying is size and lanyards fabrics, and color, that’s why it is quite possible to find a bow tie which will be suiting your face oval and body shape and suitable for the event you’re going to. There are several simple rules to follow when you’re wearing a bow tie, remember them – and they will definitely help you out when the time comes. 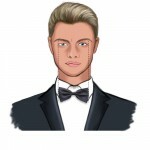 The bow tie shouldn’t be wider than the distance between outer corners of eyes or outer edges of the collar of a dress-shirt. Otherwise you’ll be looking like a clown. If you’re a beginner in wearing a bow tie, exercise a couple of times in tying a bow. For this, cross your right leg over your left knee, and tie a bow tie around your ankle like you’re tying lace on your boots. This is considered the classic way of tying a bow. Match the bow tie with your clothes and especially the dress-shirt. The bow tie looks great with a patricide collar (winged folded points) or a turndown collar. If you’re wearing a patricide collar type dress-shirt, be sure to place the bow before the collar wings (see the picture). You can find more detailed diagrams how to tie a bow tie in How to Tie a Tie app. Along with different ways of tying a tie, How to Tie a Tie presents 2 ways of tying a bow tie: simple and classic methods. 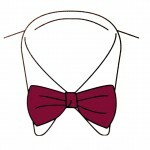 More useful advice about ties and how to wear them at http://www.mypersonalisedclothing.com. 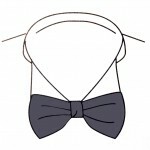 This entry was posted in Blog and tagged bowtie, how to tie a tie by admin. Bookmark the permalink.